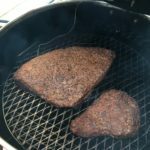 Many of you are familiar with my brisket journey and some even know the path I have taken over the last 16-months on my choice of smoker. This blog is really how a simple twist of fate can affect your future. I will flash back a bit on how this all started, when I first experienced food cooked on the Green Egg I was amazed at the flavors my buddies could create just by adding wood. 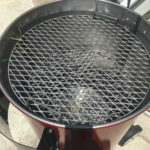 I have a big Jenn Air propane grill and had no real idea how to elevate my cooking, my idea of great food was adding GrillGrates to my grill and leaving sear marks on meat. Now I will say my food was progressing at that time, but in retrospect it was really just OK. Flash forward to the fall of 2015 and I join Mike Morrill on Rad Fondo BBQ, I went from apprentice, then brisket cook and turn in box builder. I was cooking on a Vision Kamado and did the best I could on the product I was using, but time would tell it was not best for that cook. 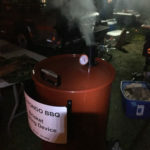 This is still a great cooker and I use it all the time, but the fear of breaking the expensive ceramic smoker by dragging to all of these competitions freaked me out. I really did not know what I was doing or why I was doing it and this is where Shuji Sakai (Shu, pronounced “Shoe”) comes into play as he has helped me understand how to cook and why we do certain things and the importance of process and consistency. 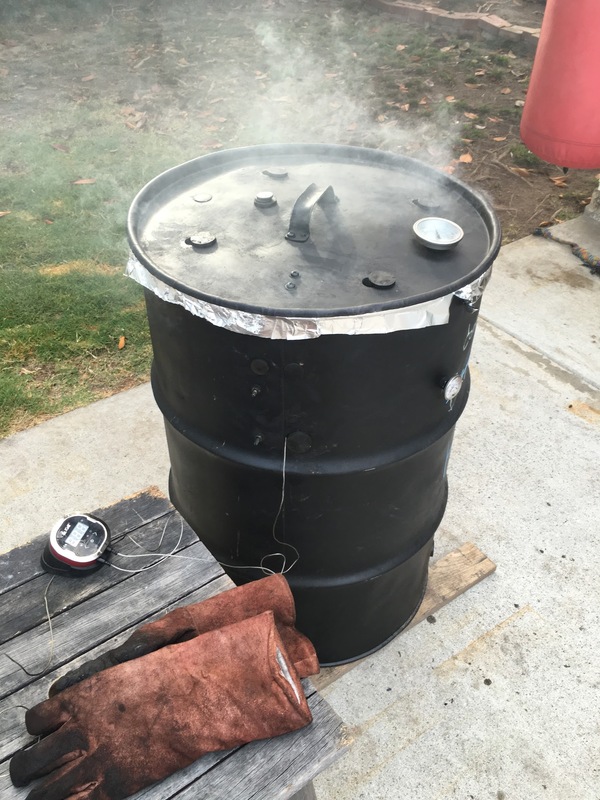 To help me elevate my skills and understanding of smoking at a competitive level, Shu suggested before I go buy an expensive drum smoker (I had been eyeing one in particular for months) that I use his old Ugly Drum Smoker (UDS). 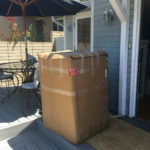 I was excited to get the drum and start the next chapter, when we arrived at his friends place in Long Beach I realized I was getting a rusty, dented old drum with a bent lid. I went home ready to refurbish the drum. I spent a few days sanding and painting the drum. I ran a few coal-only cooks to burn off the black widows, and other unidentified material in the drum. I seasoned it and bought circular magnets to create vent ports in all the pre-drills holes. I quickly realized the lid leaked like a sieve and I needed a solution, our teammate Keenan Hill suggested I line the rim of the drum with foil to help create a seal. This technique worked well until you developed some seasoning on the foil during the cook and every time you opened the lid the foil would stick, then fly off the lid and I would be either chasing it around the backyard or a competition site during the middle of the night, those were good times. This may sounds like a sad story, but it was really the most important lesson I have learned so far and that is how to manage a fire and how to cook the food when things are not optimal. The drum has no electronics, so you need to understand airflow, lid management and temperature control. 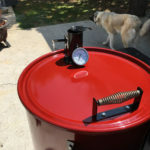 I honestly loved cooking on that drum as I really felt like I was cooking in a purer form, old drum, hot coals and a brisket. Now to the big news or as I mention above the “twist of fate”, I am now a handful of comps in with Shu’s drum and I feel like I am ready to graduate to a better drum, or one without all the warts. Let’s just say our drum had a great personality. 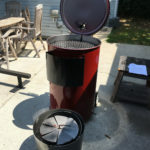 For months now I have been coveting a particular drum smoker, but was just not sure if financially I was ready (my wife was not) and if this really was the right drum for me and my needs. We are now at the Del Mar BBQ Championships and cooking directly behind us is a team from Arizona, they must have had four different smokers, that included two different drum smokers. One in particular was a drum I had never heard of or seen, when I asked the guys behind us about it he explained it was the Hunsaker Vortex Drum. 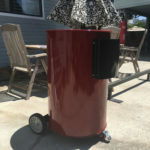 I spent the next 24 hours cooking my food and asking him questions about both drums and over and over the attributes of the Hunsaker Drum just kept checking boxes on my needs checklist. 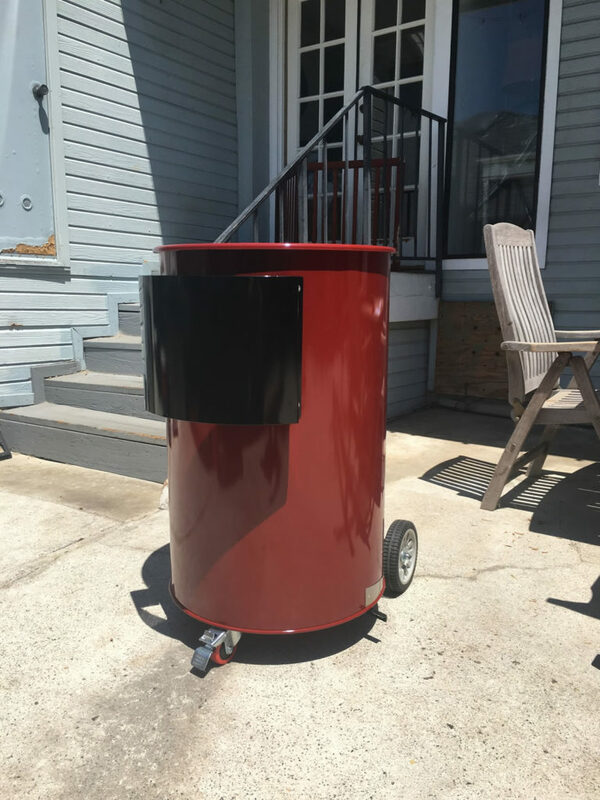 As I looked at the construction, the features and the how the Vortex airflow system worked, it really just became apparent this was the perfect smoker to help me elevate my game. I went home still wondering how I would make this happen financially and ultimately, I found a way. I sent Mark Hunsaker an email and a few weeks later my new beautiful red Hunsaker Vortex Drum arrived. The assembly was easy and may have taken 30 minutes, I am sure you could do this quicker, but I wanted to savor every step and make sure it was right. 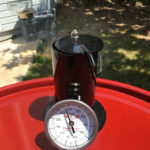 From my first cook to today I am just astonished at how well the Hunsaker Drum holds it’s temperature and ultimately cooks the brisket. It really is as close to autopilot as you can get and this is with no electronics, set the intake and then the exhaust lit the coals and go. 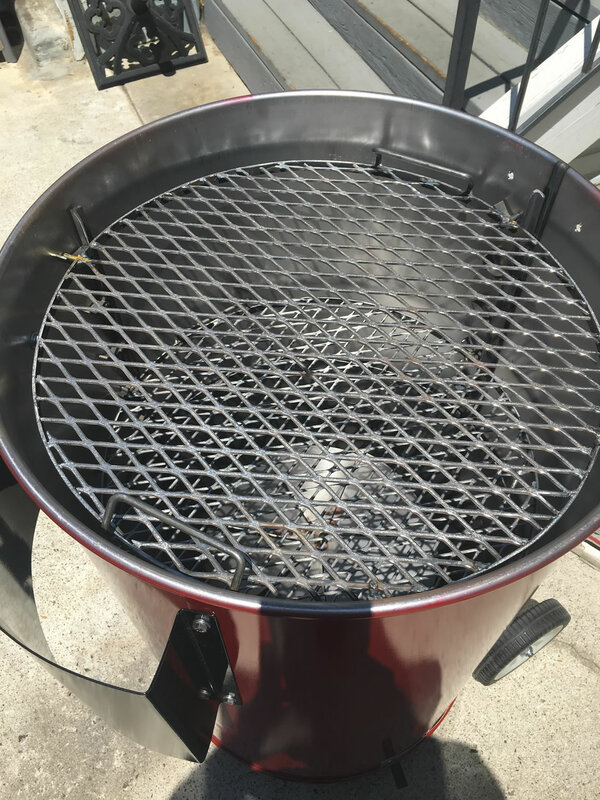 Side note: I use the Hunsaker drum to cook almost everything on the weekends, wings, shoulder, salmon and I will tell you crank the vents open, get that drum hot and cook steaks on the top rack and you will never cooks steaks on the grill again. There are several rack heights that adjust very easily (by the way the racks are built very well, actually there are no shortcuts on this drum, every component is made to last), so you can stack or cook on a variety of heights and rotate the grills very easily (important for competition cooks). Over the course of the year Mark and I have become friends and as our rookie season ended we began discussing Rad Fondo BBQ joining the Hunsaker family and we are very proud to announce that is now official. 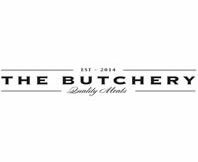 In 2017 we will be debuting our new competition BBQ trailer and in it will be two new smokers, one from Humphrey’s and one from Hunsaker. We are very excited out these partnerships and look to make them proud all year long. 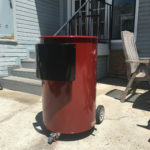 If any of you need more information on the Hunsaker Vortex Drum please do not hesitate to ask me or contact Mark directly, he is super knowledgable about BBQ and is always ready to share that information.